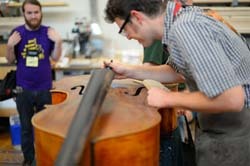 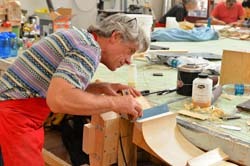 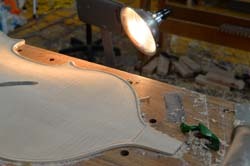 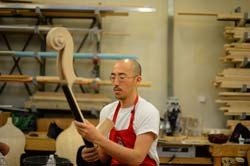 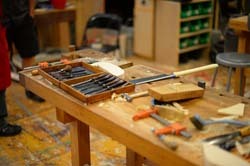 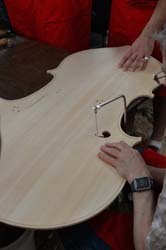 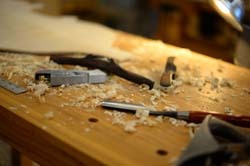 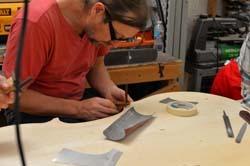 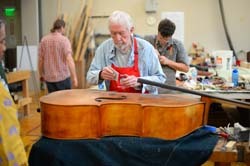 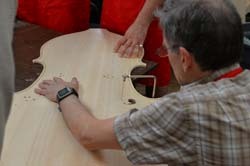 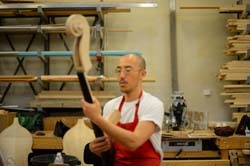 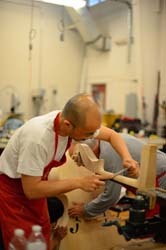 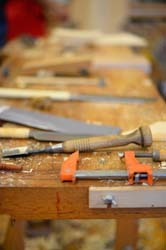 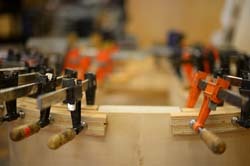 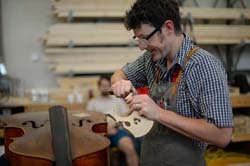 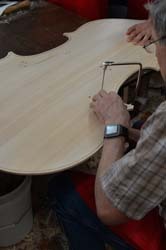 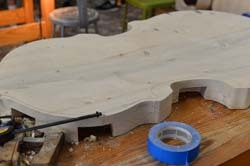 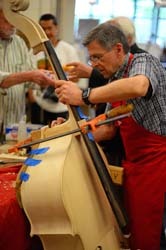 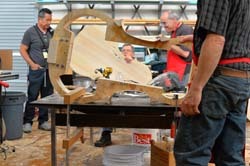 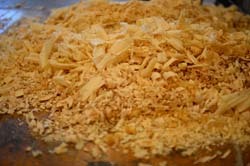 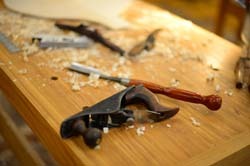 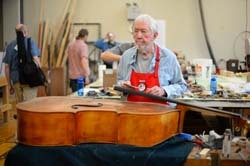 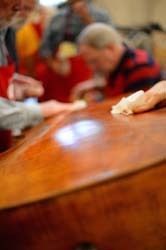 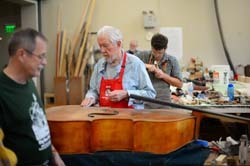 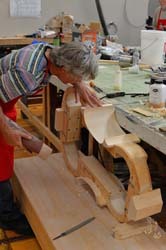 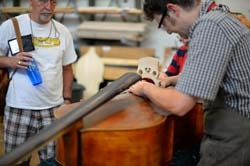 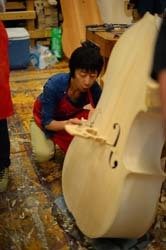 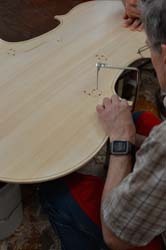 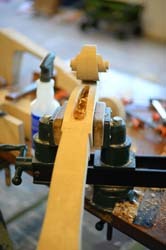 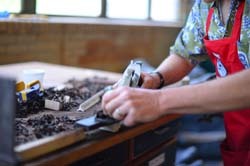 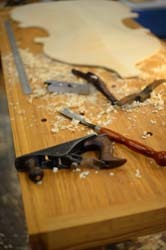 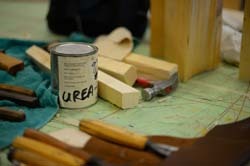 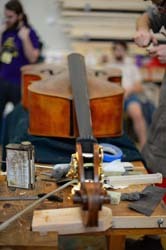 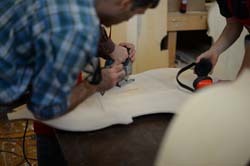 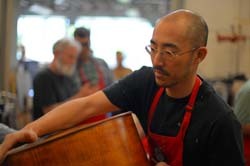 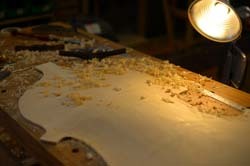 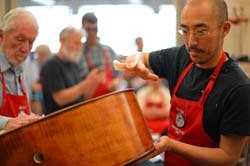 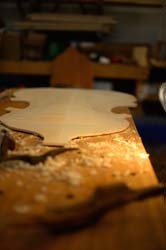 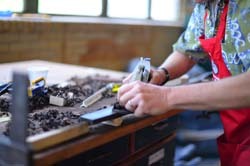 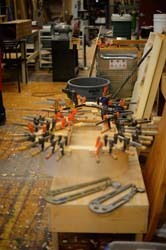 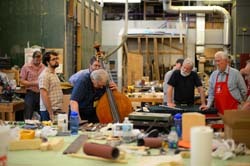 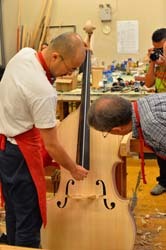 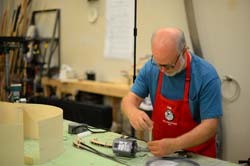 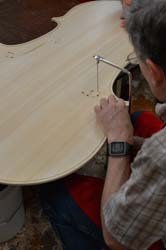 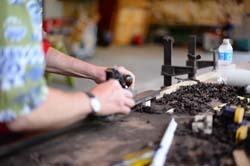 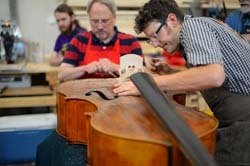 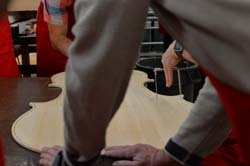 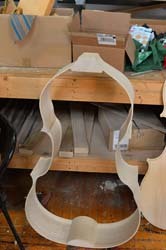 The Brotherhood of Loosely Associated Bass Luthiers of America, or the BLABLA group for short, is a group of luthiers who first met in Cincinnati to share ideas and techniques as well as get to know each other socially. 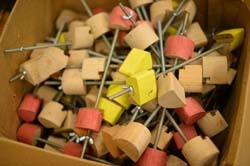 They had a crazy idea. 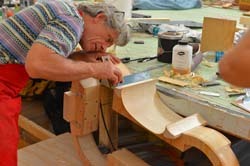 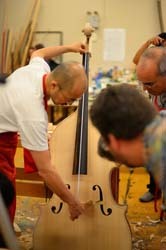 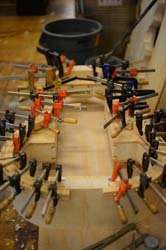 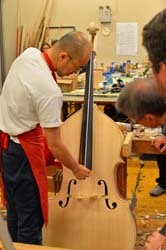 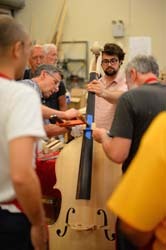 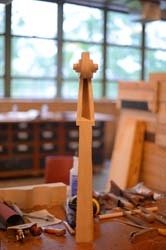 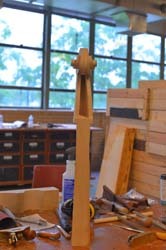 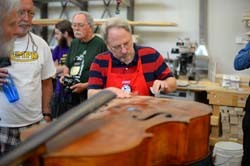 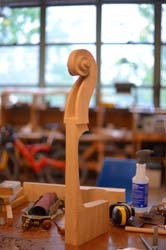 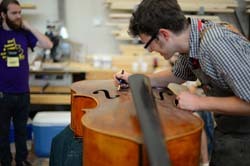 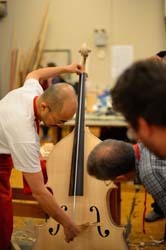 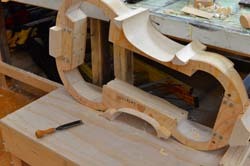 Wouldn't it be fun to try to build a bass in a week during an ISB convention and show players how it's done? 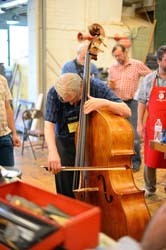 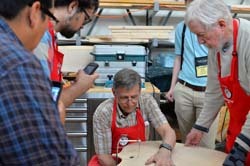 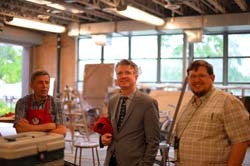 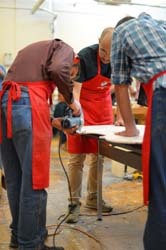 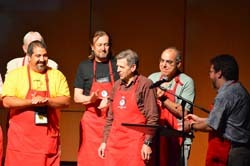 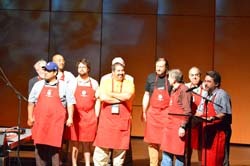 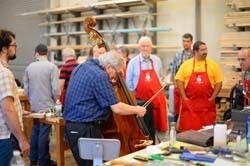 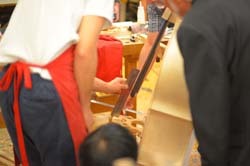 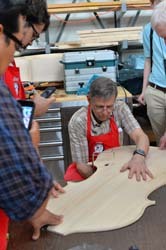 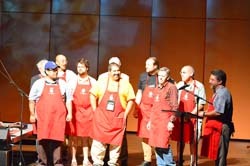 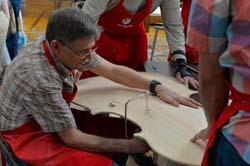 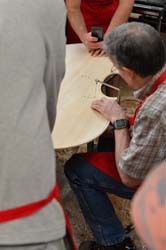 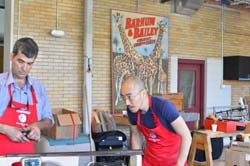 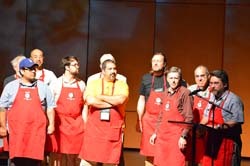 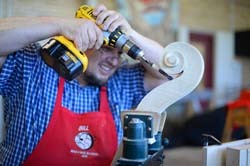 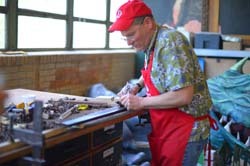 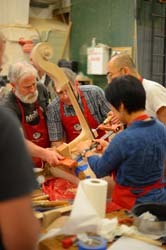 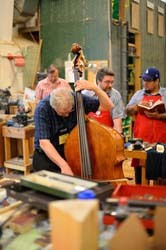 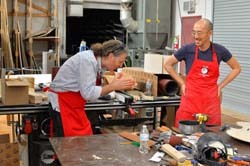 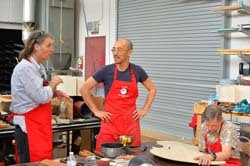 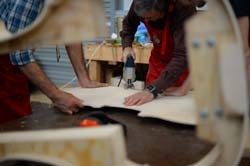 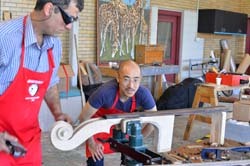 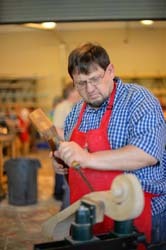 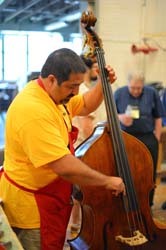 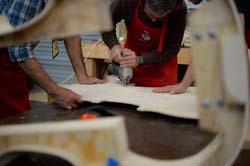 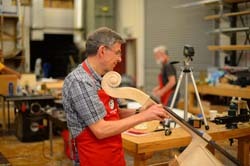 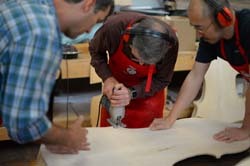 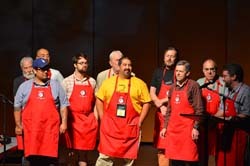 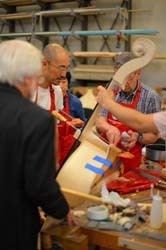 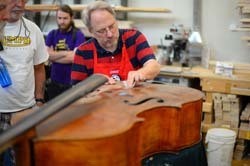 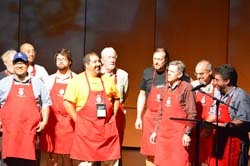 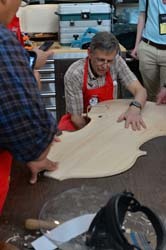 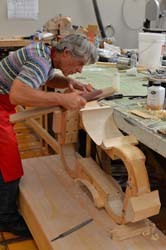 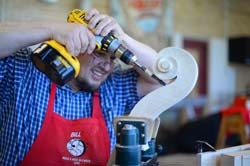 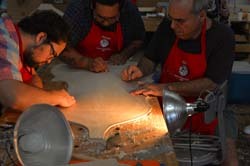 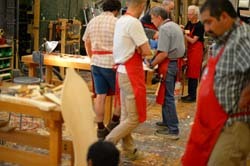 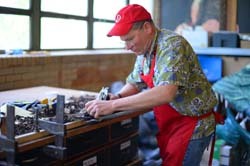 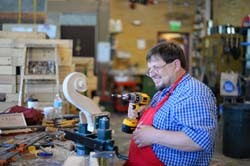 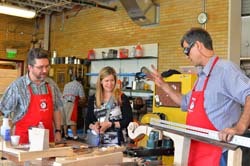 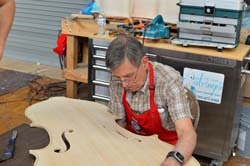 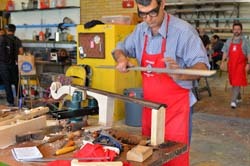 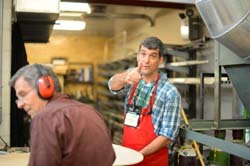 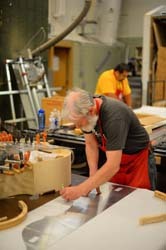 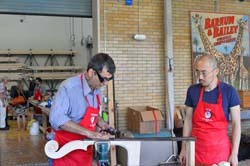 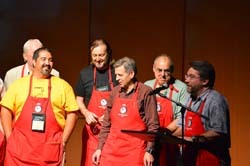 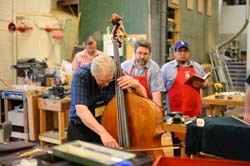 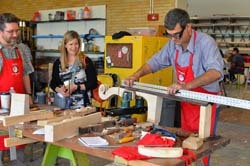 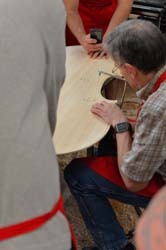 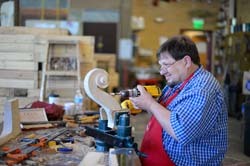 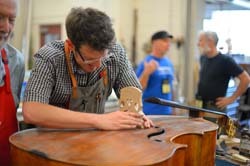 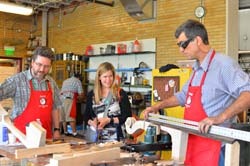 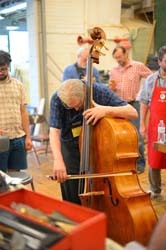 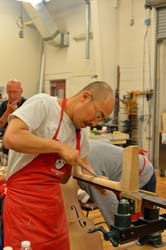 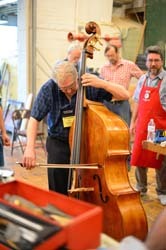 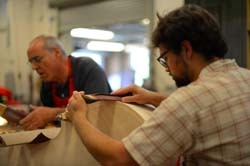 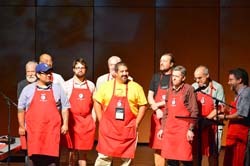 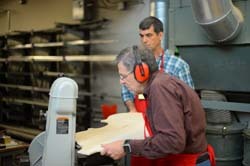 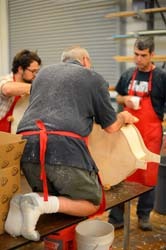 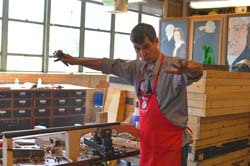 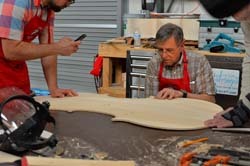 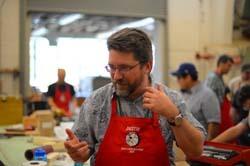 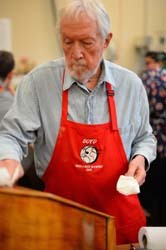 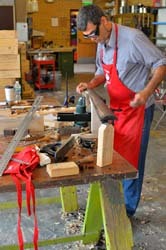 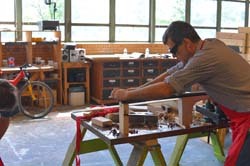 Paul Hart, an esteemed maker and teacher himself, took up the challenge and organized the "Build a Bass in a Week" team, even presenting them with personalized red work aprons as a souvenir. 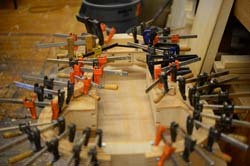 Together some two dozen luthiers from around the world built a beautiful instrument, based on a Vuillaume pattern, working day and night. 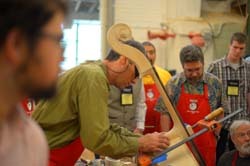 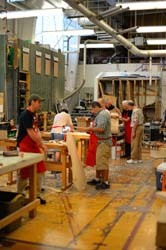 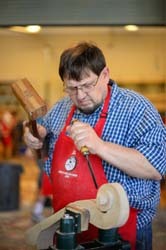 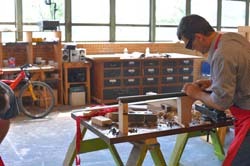 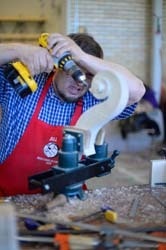 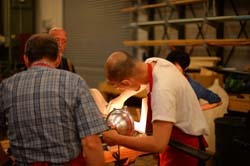 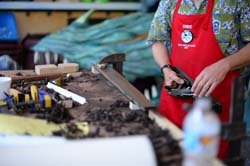 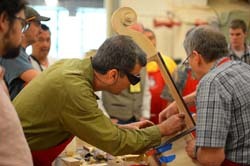 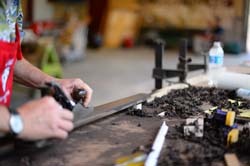 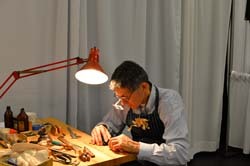 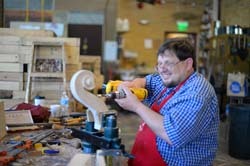 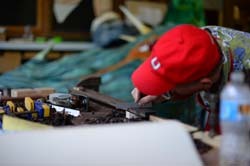 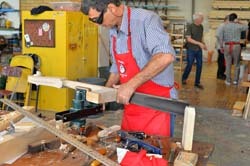 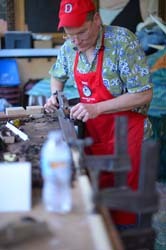 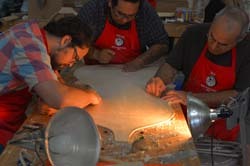 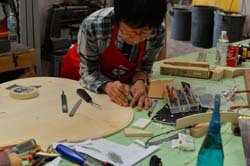 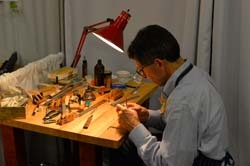 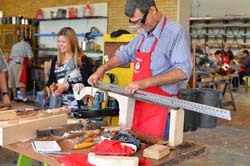 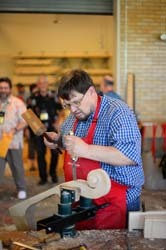 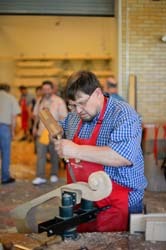 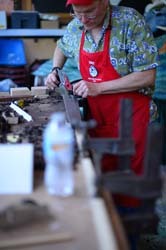 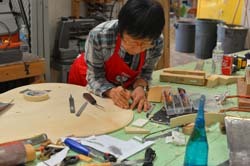 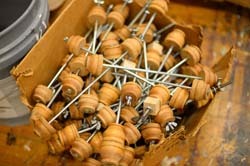 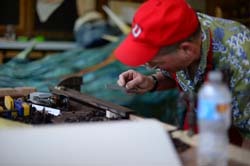 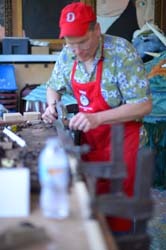 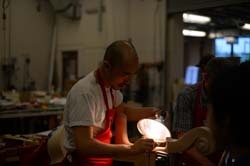 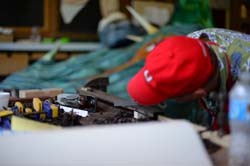 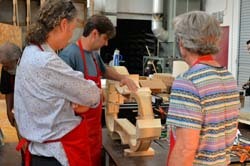 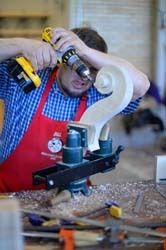 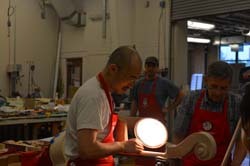 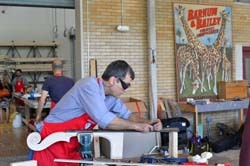 The workshop was open to the public and convention attendees were able to see every step of the process. 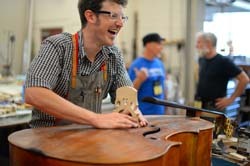 It was a revelation for all of us! 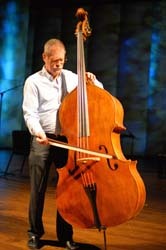 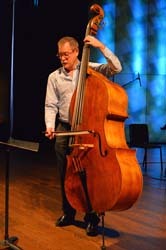 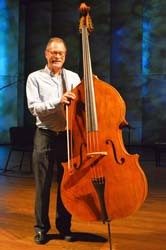 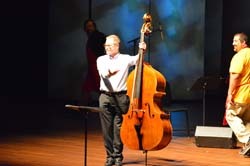 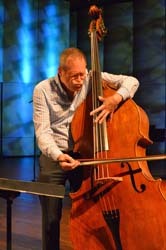 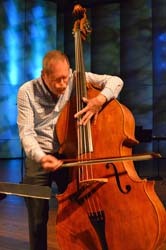 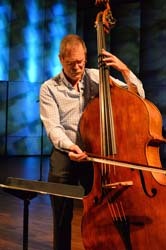 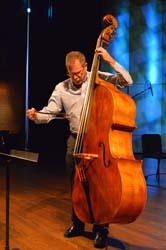 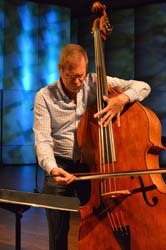 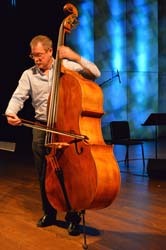 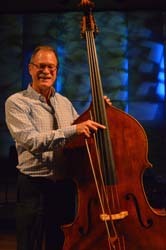 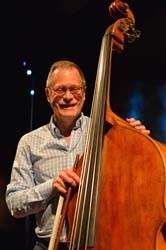 David Murray dedicated the instrument on Friday evening on the main stage, performing a work for solo bass by Dave Anderson. 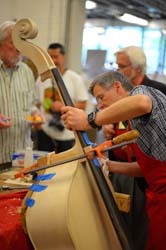 The instrument was raffled off and netted over $10,000 benefitting the ISB. 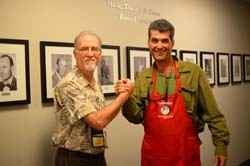 The lucky winner of the drawing was Sarah Klein. 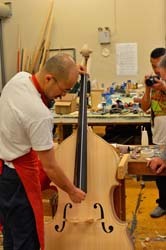 The ISB is grateful far beyond what words can express to the amazing work and contribution of so many hours of time and talent by Paul Hart and the 2015 "Build a Bass in a Week" Team! 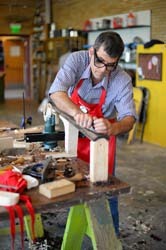 You may click on any image to see a larger version or start a self-guided slideshow.